One of my most favorite family traditions is making handmade ornaments just around Christmas time. We create one for our own tree (naturally) and give the others away to our family members as part of their Christmas gift. 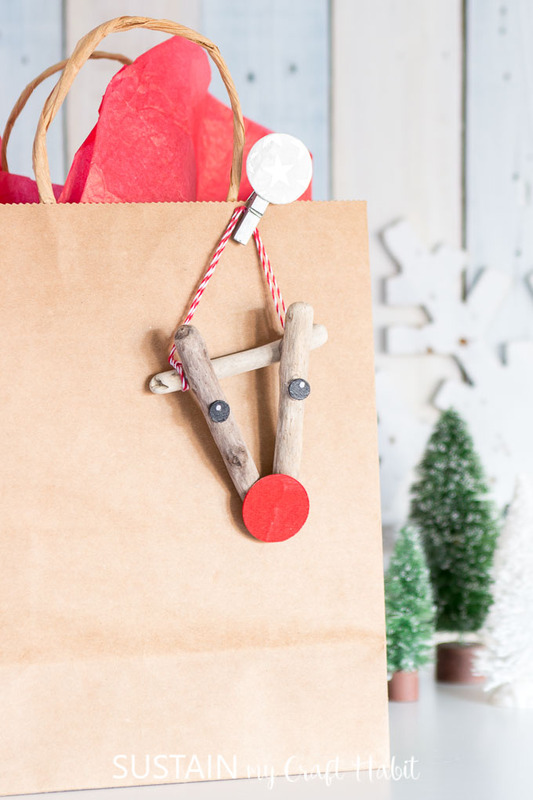 And since reindeer crafts go hand-in-hand with the holidays, we decided to create these adorable reindeer ornaments. These simple ornaments were made using small pieces of driftwood we collected on the beach near our family cottage so they definitely have sentimental meaning. 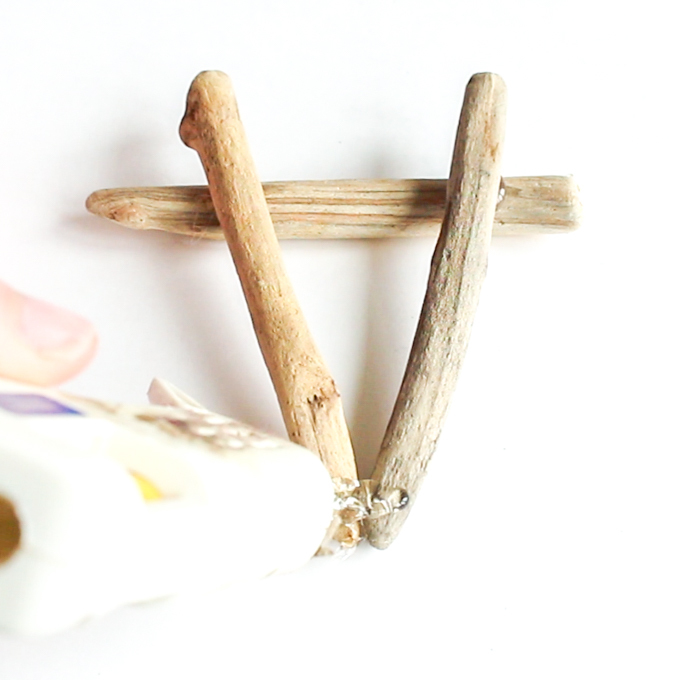 We do have a bit of a driftwood obsession as you might discover from our other DIYs. 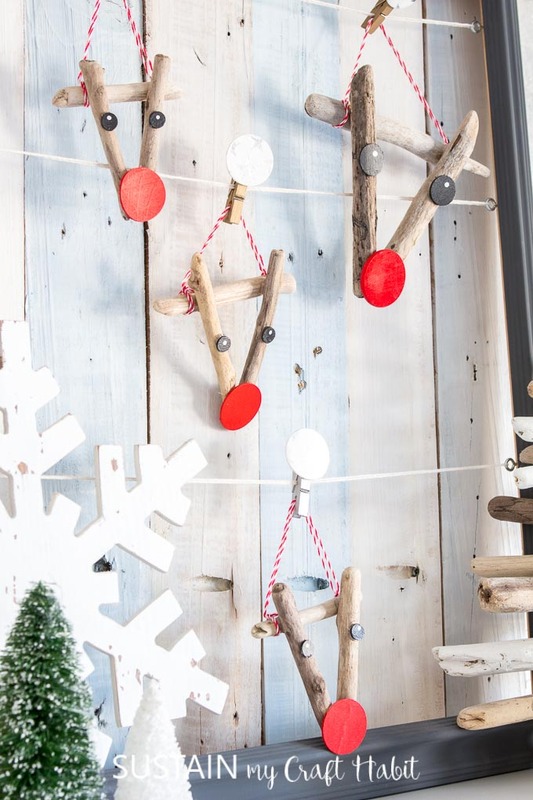 These include a full-sized driftwood Christmas tree (yes, that’s right, I said full-sized) and a quirky driftwood nightstand (which ironically resembles reindeer legs!) to name a few. 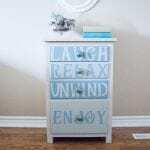 But they can just as easily be made with cut down twigs, popsicle sticks and even cinnamon sticks! 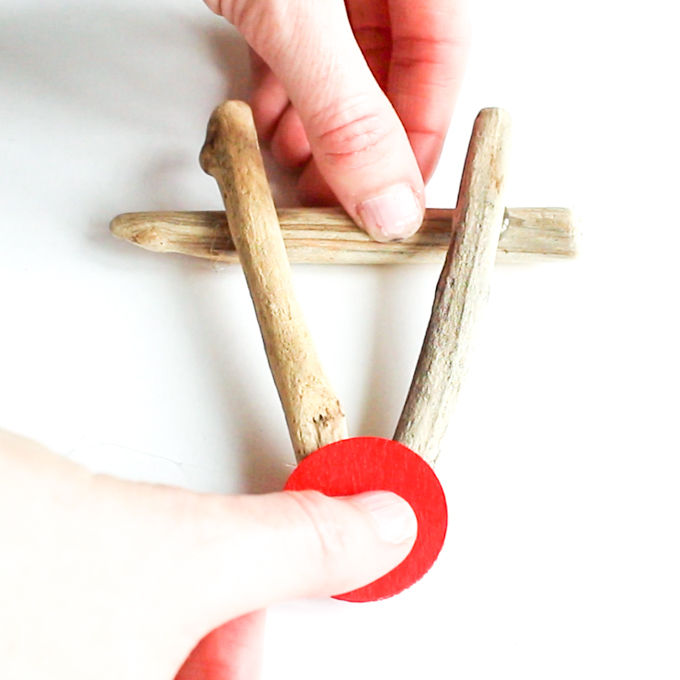 There are so many possibilities with these simple reindeer crafts. 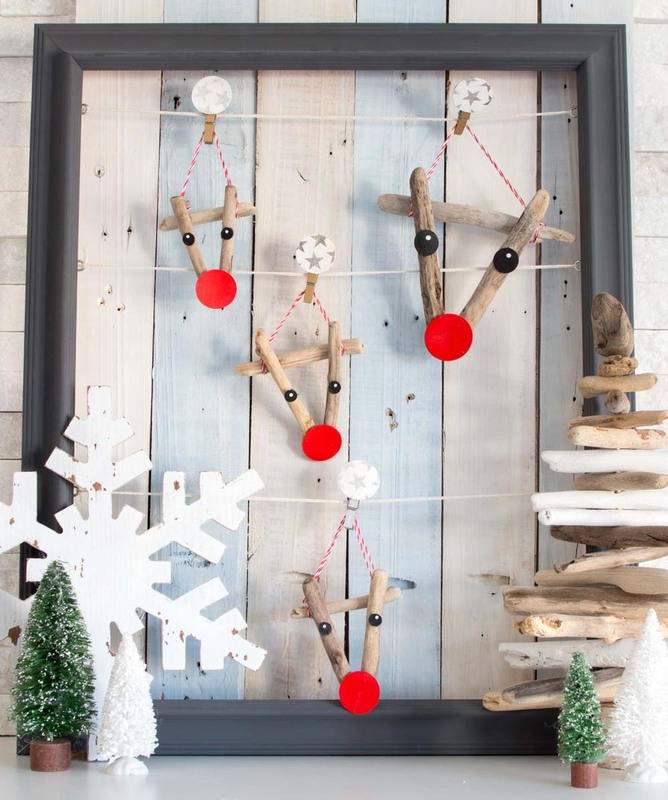 We couldn’t resist making a family of reindeer with different sized driftwood pieces. 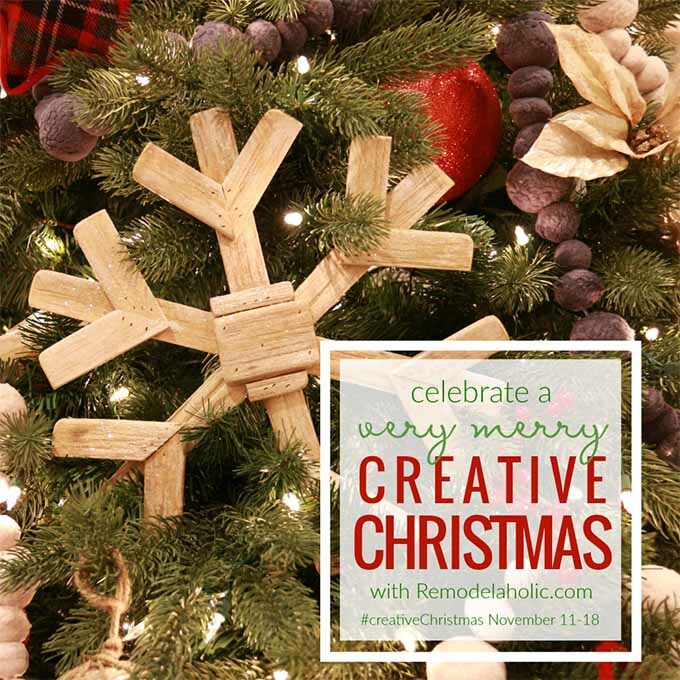 This simple Christmas craft idea is part of the Remodelaholic #CreativeChristmas challenge. 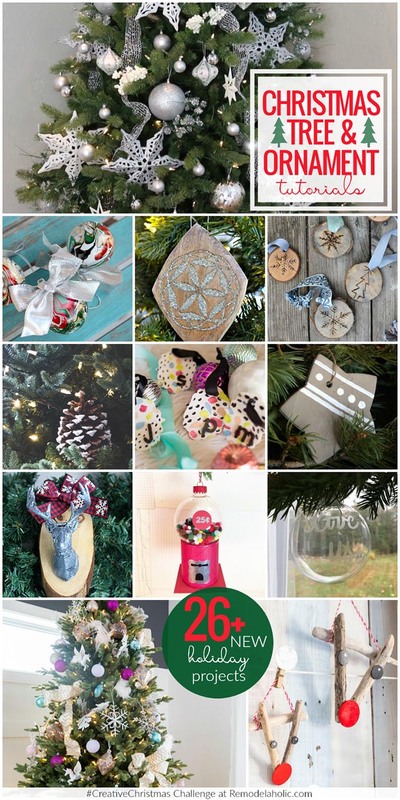 You’ll find links to all the inspiring DIY Christmas ideas at the end of this post. 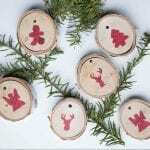 In addition, there’s over a dozen Christmas crafty videos in this fun YouTube playlist. So grab a coffee and enjoy! 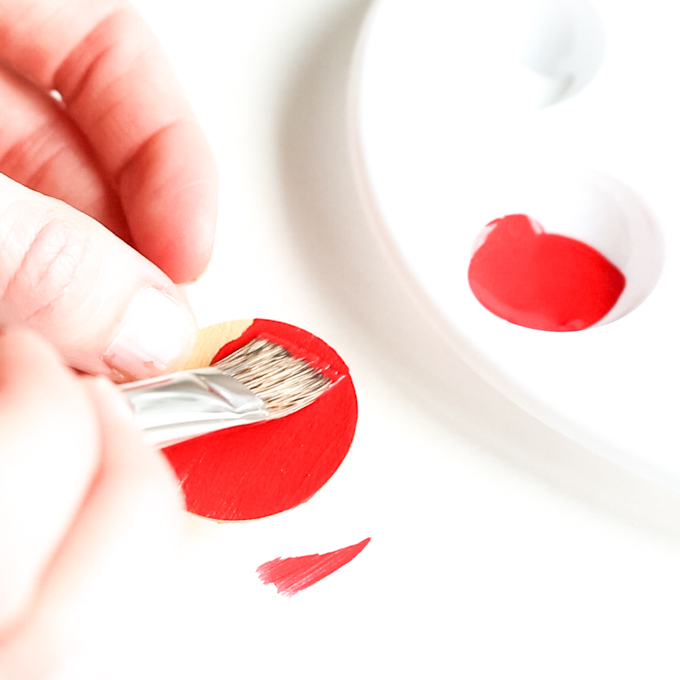 Paint all sides of the larger sized wood circle in Lipstick. This makes the reindeer’s nose. Put it aside to dry fully. 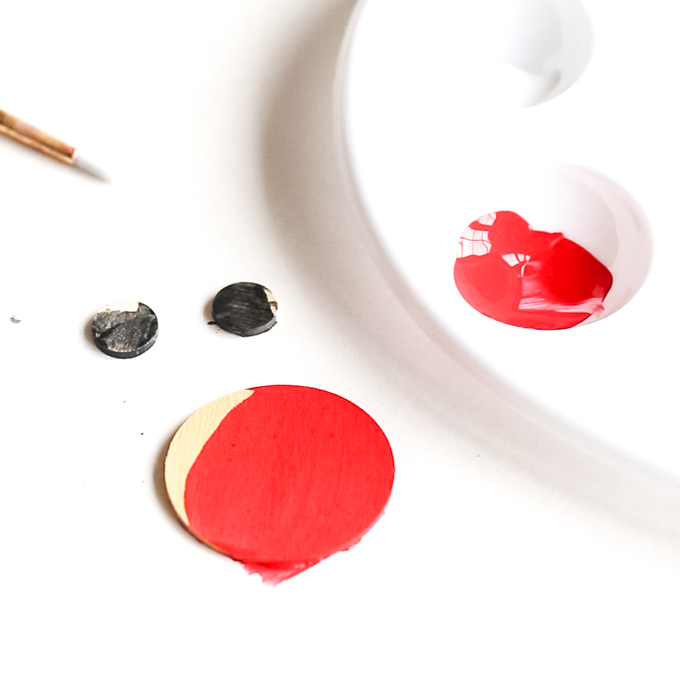 Paint all sides of the smaller sized wood circle in Black Tie. Let them dry fully before moving on to the next step. 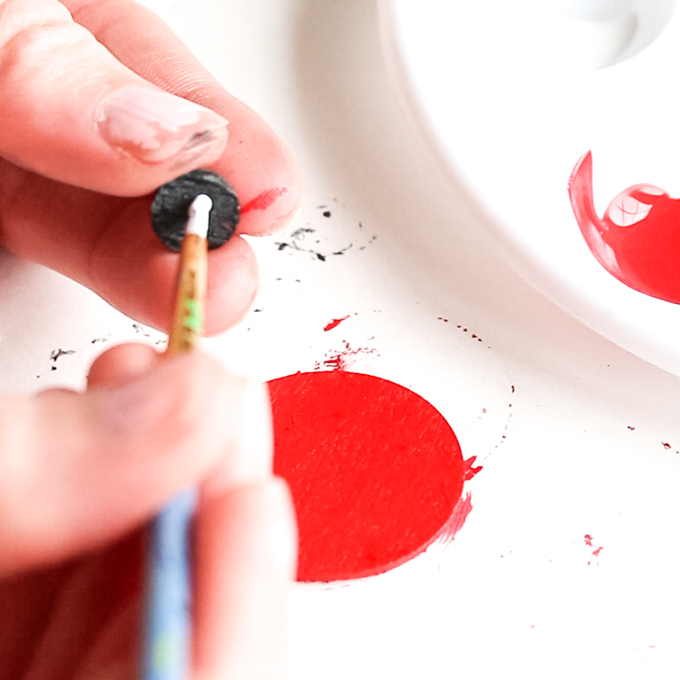 Using a fine tip paint brush, dip the brush into Cotton Ball and add a small white dot to each small black painted wood circle. These are the reindeer’s eyes. 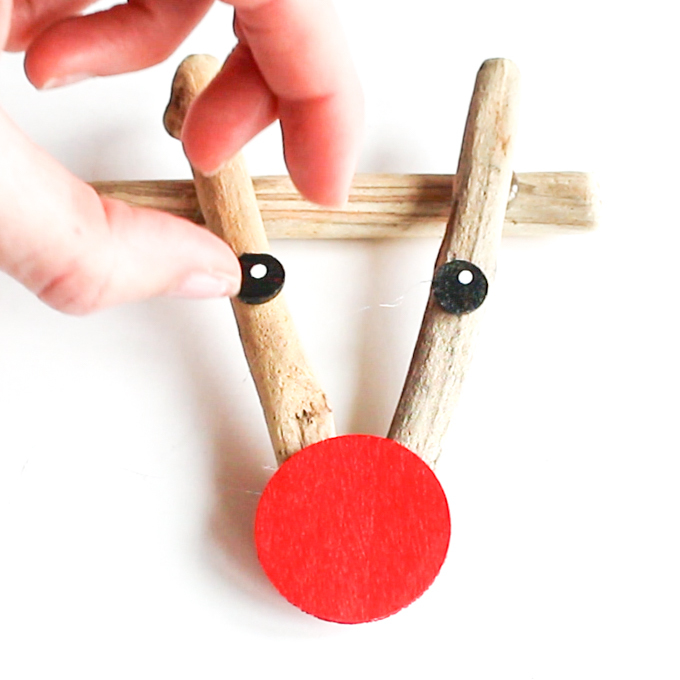 Position the driftwood pieces into an upside triangle to form the reindeer’s face overlapping the “antlers” as shown. Using a hot glue gun, apply a dab of glue to the intersecting points and press the pieces together to set in place. Add a dab of glue to the bottom of the triangle and glue the red nose in place over top of the triangle point. 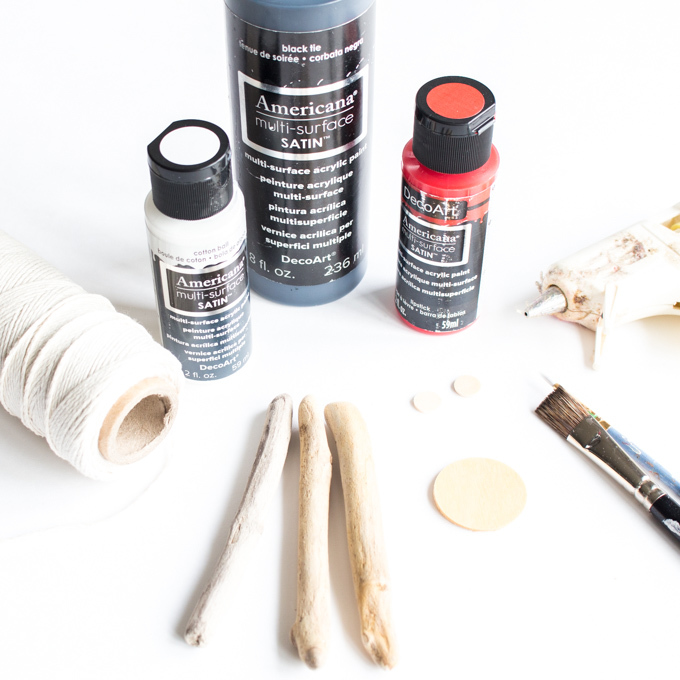 Add a dab of glue to the back side of each eye and press in place onto the driftwood. Cut the baker’s twine and attach the top of the reindeer for hanging. Just like that, you have an adorable reindeer ornament that’s perfect for the Christmas tree or as a decorative gift tag. 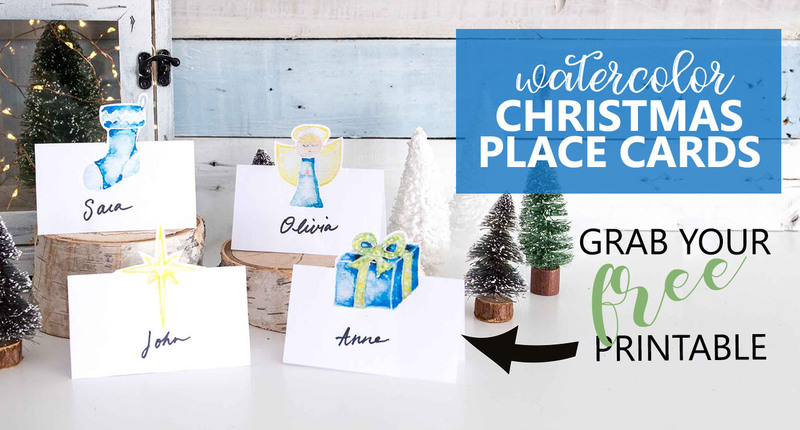 You could also pair them with these free printable Christmas gift tags. Enjoy! 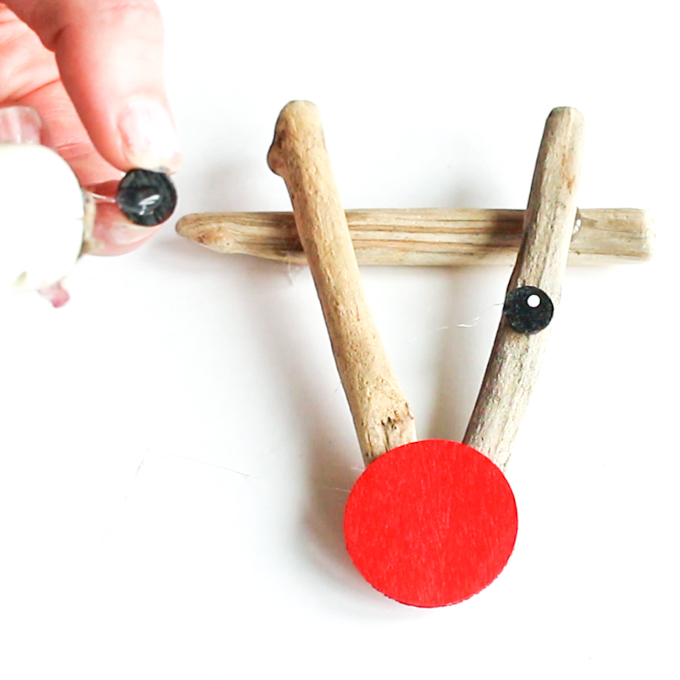 We hope you’ve enjoyed these reindeer crafts. 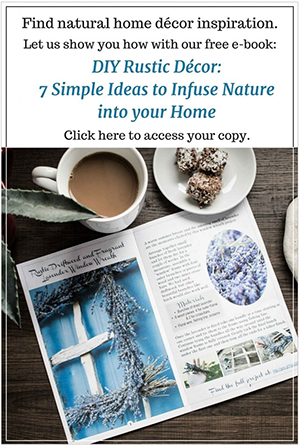 As promised, here are links to over two dozen ideas to get you in the holiday decorating spirit! So very cute! Looks just perfect on the outside of a giftbag…and ideal for your beach house Christmas tree. I live on the coast too, so need to ground up some driftwood. Yes! How wonderful it must be to live on the coast. 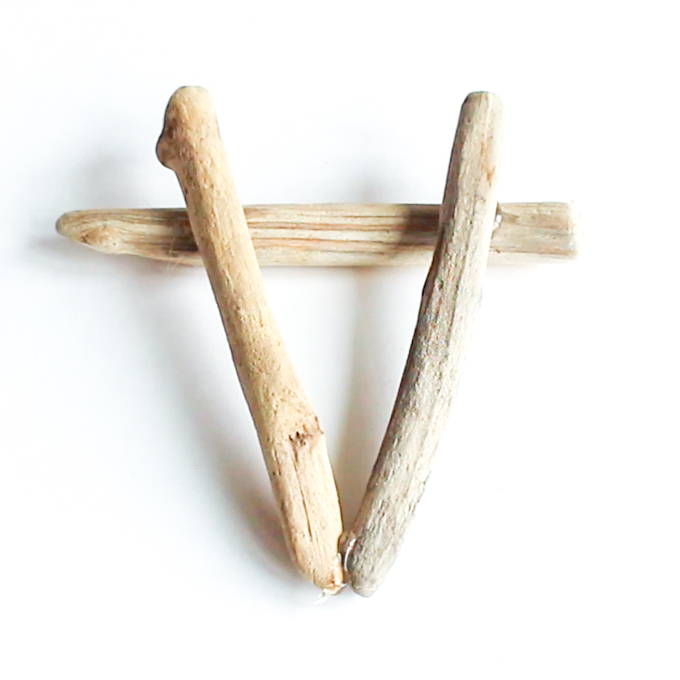 Make the most of it and collect that driftwood! What a sweet ornament to make with kids! Love that it’s driftwood. Thanks for sharing! 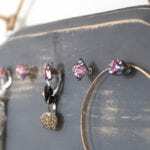 It is a great ornament to make with the kids! I made a variation of these last year with my daughter and she gave them to her aunts. These are so cute! 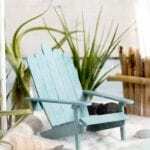 We are going on a beach vacation again next summer and now I know what to collect driftwood for! Absolutely! I’d be taking an empty suitcase;) Enjoy your beach vacation! These are so cute! 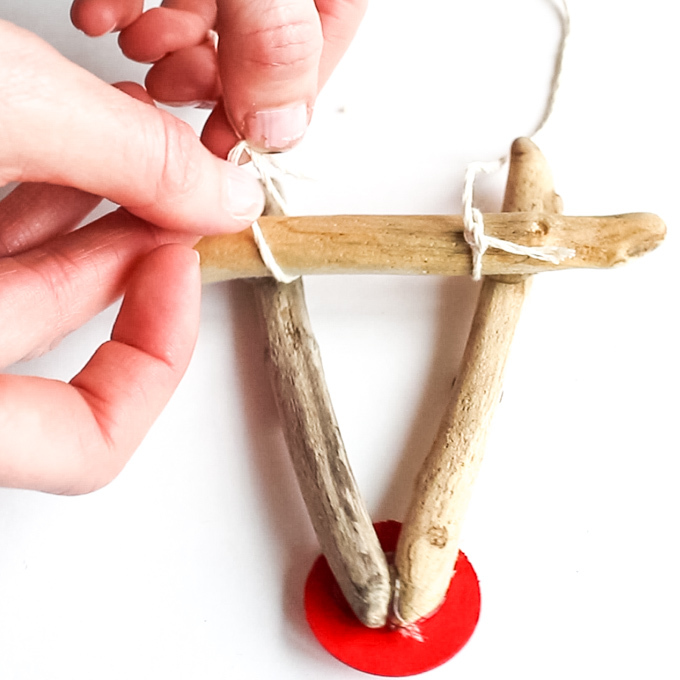 I can see using driftwood to make lots of different kinds of ornaments too! Thanks for the ideas! So very true, there are so many possibilities. We just need to get a little creative!